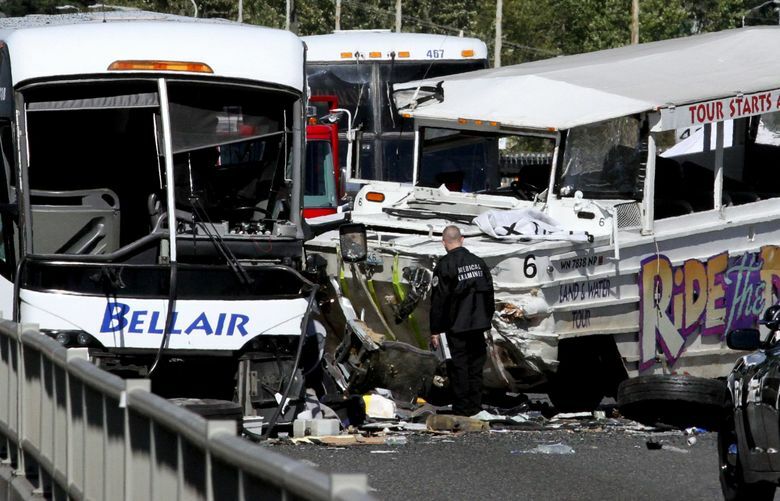 Three years after a Ride the Ducks vehicle crashed into a tour bus carrying international students on the Aurora Bridge in Seattle, more than 40 victims are ramping up for their day — or rather their months — in court. The King County Superior Court judge overseeing the civil suit filed on behalf of Phuong Dinh and 42 other victims of the crash that killed five and injured more than 60 people is slated to hear pretrial motions this week. Under consideration by Judge Catherine Shaffer are motions by plaintiffs to unseal prior settlements with other victims. Defense attorneys are asking the judge to bar victims’ attorneys from talking in front of jurors about things they say are irrelevant to the crash, such as the Ride the Ducks maintenance department’s staffing and funding prior to 2013 or the salary of Ride the Ducks Seattle owner Brian Tracey. Presentation of evidence and arguments on the motions could take several days, according to the clerk’s office. Jury selection could begin by the end of the week and last at least a week as the court attempts to find potential jurors who can absorb the hardship of sitting through a complicated trial that may last six months. Opening arguments by attorneys for the victims of the crash and the defendants, Ride the Ducks Seattle, Ride the Ducks International, the City of Seattle and the state of Washington are expected to begin mid-month, according to court officials. Earlier this year, the City of Seattle agreed to pay more than $2 million to the families of 12 victims, although the city had argued that it should not be held liable in the suit because the state, and not the city, bore responsibility for bridge safety. The state also settled with those same 12 families. The 2016 suit claims that Ride the Ducks Seattle, a locally owned Ducks licensee, Branson, Missouri-based Ride the Ducks International, as well as the city and state all bear some responsibility for the fatal collision. The investigation into the Sept. 24, 2015, incident by the National Transportation Safety Board (NTSB) showed the crash was caused when one of the Duck vehicle’s front axle broke, causing the Duck vehicle to veer into a tour bus of North Seattle College students. The suit also alleges that Ride the Ducks International, which refurbished the World War II-era Duck vehicle that crashed, had issued a service bulletin to Seattle Ducks recommending the axle be repaired on the vehicle that was involved in the crash. The local excursion firm did not make the recommended axle fix, investigators determined. So far, 15 victims have settled their suits, according to Karen Koehler, an attorney for the 43 victims represented in the case. In addition, she said, the members of two victims’ families joined the case late and will be heard in a separate trial. Two other attorneys representing four other victims also are slated to try their cases later. Trial briefs indicate that plaintiffs’ attorneys intend to argue that the recreational use of Ducks vehicles, which were originally built for war starting in 1942, was misguided and hazardous from the beginning. Others have raised safety questions about the amphibious vehicles, and other fatal accidents have occurred. After 13 people were killed when a Duck boat sank in Hot Springs, Arkansas, in May 1999, the NTSB called for sweeping changes to the way such tourist boats operate and are regulated. This past July, a Duck boat was swamped when a sudden storm swept across Table Rock Lake in Branson. Of the 31 people on board, 17 drowned. The designer of Duck 6, the vehicle involved in the 2015 Aurora Bridge crash, had originally been hired to manage Ducks International (then called Ozark Scenic Tours.) He had no background, training or certification in mechanics or engineering when he started repairing and overhauling vintage Ducks and remodeling newer versions, court documents allege. The vehicles “should never have been allowed to become tourist ‘Ducks,’ ” plaintiffs allege in court documents. The company admitted to the 159 critical safety violations and 304 record-keeping violations two years ago and agreed to pay $222,000 in penalties to settle the state complaint.